Trinitarian Questions Answered	Are Christmas Trees in the Bible? To be in a position to be “saved” therefore one must believe in the gospel and be baptised. We have already considered baptism in previous posts and articles but in this article we will look at what the gospel consists of and what it is we need to believe. So the principle is that we cannot save ourselves and that being ‘saved’ will be a gift of God. How are we saved? Through faith. In what? The gospel as Jesus has told us. So the Ephesian believers, now baptised into Christ had become a part of the covenants of promise. They were no longer aliens from the things of Israel. The things which had been promised to that nations fathers. What things? Well to understand that question you would have to study the promises of God to Israel and in particular to the fathers of Israel, Abraham Isaac, Jacob and King David. 1. Genesis 3 – promise of the seed which would destroy the serpent power, associated doctrine: atonement in Christ. 2. Genesis 12-22 – promises, to Abraham, associated doctrines: resurrection, eternal life, forgiveness of sins, Israel to be a great nation, atonement in Christ. 3. 2 Samuel 7 – promises to David, associated doctrines: Christ on the throne, Kingdom of Israel restored on earth, resurrection, Christ’s second coming. So then the gospel is the good news of the promises of God and how they will and are outworked in the Lord Jesus Christ and how we can be associated with them. There are two parts “the name of Jesus Christ” and “the Kingdom of God”. Christadelphians believe their statement of faith is a summery of the gospel and associated doctrines. You can view this here » Obviously as time has gone on much error has crept into “christianity” and therefore we require more clarification on certain doctrines than maybe the apostles of old did. For example the doctrine of the “Trinity” was not then known in a Christian guise and therefore the apostles would not of had to labour the unity of God. Because the statement of faith summarises the things required to be saved we uphold and guard the things expressed within it passionately. Our beliefs define us as a community and those not believing the things we profess to believe are asked to leave as they are not Christadelphians anymore. Because they have moved away from the gospel they do not subscribe to what Christadelphians believe in (see this principle being outworked by the Apostle Paul in Acts 19:8-9). We call the different aspects of the gospel “first principles”. The first principles never change and a knowledge of them makes you accountable to baptism. Once baptised you need to show your faith in works (James 2:18). Studying the scriptures and thinking upon them allows your knowledge of Gods principles to grow enabling you to help overcome sin and manifest God in your character in some small way. However once you understand the gospel there will not be new fundamental truths revealed to you – anything new will build upon the foundation already laid in the gospel (Ephesians 2:20). Is a person who does not accurately know the gospel able to be saved? 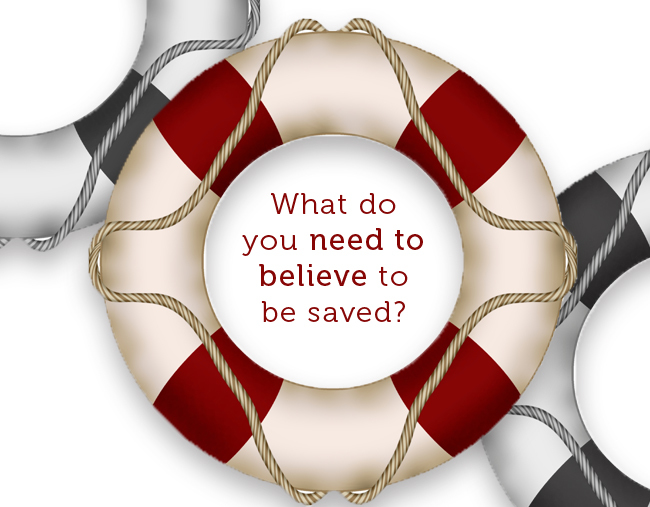 No – the Bible tells us we need to have faith in the gospel to be saved as we have seen in Mark 16:15-16. If what the person thinks is not a true reflection of the gospel as revealed in the word then they cannot believe in the gospel or been baptised correctly into that gospel. According to the words of Christ in the reference quoted, they cannot be saved. Many may say this is a bit of a legalistic way of looking at things. God can save who he wants they will say. This is a fair point but God does not lie. Therefore he will not go back on what he has revealed in His word. The word sets out the process for salvation based upon a belief in the gospel. So then it is very important that we understand and uphold the principles of the gospel if we are to be “saved” in that day. I urge you therefore to study your Bible to gain a better understanding of the promises God has revealed in His word. You may also find some helpful articles in the Bible Teaching part of this website.